Water Coming out From Under Cabinet. Home / Lakewood Ranch Plumber / Water Coming out From Under Cabinet. Water coming out from under the cabinet of your kitchen sink or your bathroom vanity is a sure sign of a plumbing problem. Look at the picture of the pipe we recently took out. The holes in the copper pipe, called “the waste arm” was the cause of the water coming out from under the cabinet. This type of leak happens very slowly over time. You may start to smell a musty smell before you see water. Sooner or later, the last straw is going to break the camels back, so to speak. Then you will start to get water on the floor when you use that fixture. When you call a Plumber to come fix your problem and this happens to be the cause, make sure your Plumber replaces the entire piece of copper. A Professional Plumber will always replace the entire waste arm. Because even if you only have a small hole in the waste arm, sooner, more than later the rest of the pipe will cause you a problem too. After all, it is all the same age. As the old saying goes, don’t be penny wise and pound foolish! Your Sarasota Plumber or your Bradenton Plumber will use schedule 40 pvc pipe to replace the waste arm. While under the sink, look at the connections to the sink itself. If they look corroded, now is the time to make all new connections. This will save you a line item on your honey dew list down the road. Let your Plumber take care of this task for you. He should have a fully stocked truck, like Wimpy’s Dependable Plumbing trucks, at your house ready to tackle any plumbing problem you may have. Neat, clean, honest and just plain Dependable. Wimpy’s Dependable Plumbing. 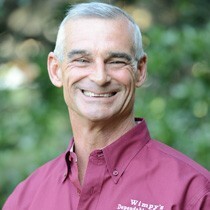 Call us today, Wimpy’s wants you to Love Your Plumber! 941-322-1911 or schedule on line at www. Loveyourplumber.com.